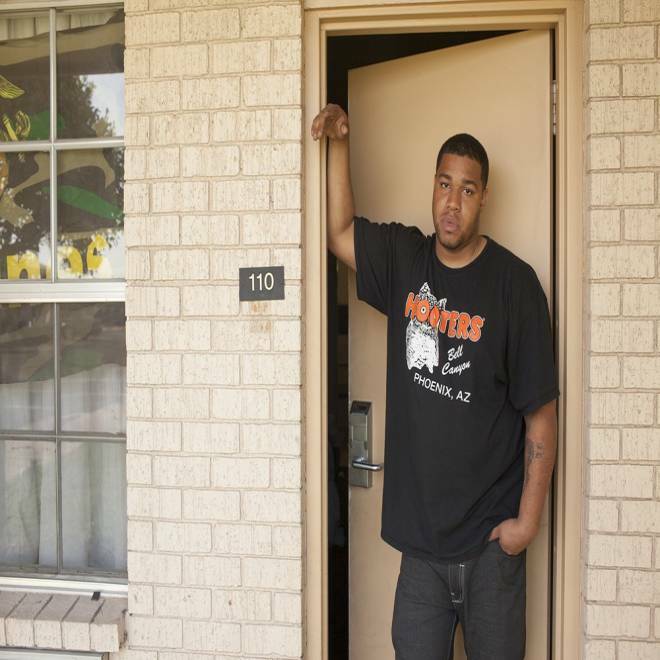 "I had seen some stuff that I probably would have never seen before in life had I not been in Marine Corps, some good stuff and some stuff I just don't care to think about anymore," said Iraq War veteran Eric Swinney, seen here outside his room at Grand Veterans Village in Phoenix. Despite funding that has reached $5.8 billion annually and a slew of innovative community partnerships, the Obama administration is lagging in its goal to end homelessness among veterans – or, as federal veterans' leaders like to say, “drive to zero” – by the end of 2015. If the current rate of progress is maintained, roughly 45,000 veterans would still be without homes when the deadline passes -- a big improvement since the drive was launched but also evidence of how difficult it is to eradicate the problem. Scott hammers at the problem in a state VA officials hold out as a shining prototype, where in 2012 veterans accounted for just 13 percent of the adult homeless population — down from 20 percent in 2011. He oversees a tangible symbol of that drive, a former Howard Johnson hotel refurbished into apartments meant to shelter more than 130 homeless veterans. It’s called Grand Veterans Village. Flashbacks, panic attacksManning the community’s gas grill most days is Iraq veteran Eric Swinney, who arrived there in early March. Originally from Mississippi, the former Marine’s barbecued specialties include ribs, chicken and pork chops. He doesn’t talk much about his brief homeless stretch. But his spiral seems fueled by what he saw in Iraq — and what he sees in his nightmares. “I picked up heads, legs. I picked up blown-up hips from two blocks away, from the roofs of houses. Numerous, numerous occasions. Iraqi people parts,” said Swinney, 26. The human pieces were ripped away and strewn during firefights or suicide-bomber blasts. Smoking and joking on the second floor of what used to be a Howard Johnson's in Phoenix, Iraq War vets Zeb Alford, left, Trent Stubbs, center, and Swinney pass the time at Grand Veterans Village. “I have this one image, every time I sleep, of picking up the head of an Iraqi.” In his room at Grand Veterans Village, the flashback wakes him often, he said, leaving him soaked in perspiration. Nothing new, though. Swinney began feeling what he calls “mental anguish” before leaving Iraq in 2008. From there, his descent reads like a manual on post-traumatic stress disorder: foreboding and booze and bad luck. “Every time something happened that reminded me of Iraq, I would just go get me a bottle and start drinking.” Then, a DUI arrest in Georgia. Then, panic attacks, which left him unable to hold any of his six or so post-war jobs. During his eight months in Phoenix, however, Swinney also had been visiting the local VA center, meeting with caseworkers. When he became homeless, they steered him to U.S. Vets, to Scott and to Grand Avenue. There, his rent is covered by U.S. Vets. Next, Swinney will be paired with local experts who "are going to assist him with some of the trauma he's brought back from war," Scott said. The plan is to have Swinney find his financial footing and, eventually, move into a more permanent apartment where he will be responsible for the lease. 'Daunting challenge'That federal-community safety net — housing wrapped around social services, in dozens of cities — is precisely why VA officials remain outwardly confident they can meet Shinseki's 2015 objective. "Yes, we know it’s an aggressive goal. But we work hard at this every day to try to achieve it. Because for us, it’s really just not acceptable to have anybody on the streets with the capabilities and the opportunities that are around now," said Vincent Kane, director of the VA National Center on Homelessness Among Veterans. "With the focus, the attention and the commitment we're putting to this as a health-care system, [VA has] the best opportunity now than at any other point in the history of our program" to hit that mark, Kane said. One program making a dent is HUD-VASH, run jointly by the VA and the U.S. Department of Housing and Urban Development. Under that plan, veterans receive housing vouchers and access to case management and clinical services. Since 2008, Congress has appropriated $350 million to HUD-VASH, which has handed housing vouchers to more than 47,000 veterans and their families, according to HUD. Armed with such initiatives, "we believe we are going to quicken the pace" to house all veterans, Kane said. "We know it’s a daunting challenge. Nightmares and all, Swinney plans to be one of the success stories in that intended final tally of zero. He is a proud man, and thankful for his service, no matter where it has taken him five years after leaving Iraq. "I hate when people feel entitled to stuff. Being a Marine helped me in a lot of ways. Yes, it had its drawbacks. But what it all boils down to is we’re average Americans, like everybody else. We just had more dangerous jobs," he said. "Nobody owes me anything." Has disability become a 'de facto welfare program'?